AMES, Iowa – The 102nd meeting between the Kansas State Wildcats and Iowa State Cyclones was the highest-scoring contest in the series history, but the Wildcats fell in the fourth quarter 42-38 in front of 54,430 fans at Jack Trice Stadium on Saturday. K-State (5-7, 3-6 Big 12) squandered a 17-point lead that they held with 12:27 in the fourth quarter, as Iowa State scored 21 points unanswered in the final period. The 17-point comeback tied for the largest fourth-quarter comeback in school history. The K-State loss snaps a 10-game winning streak against the Cyclones, with the last Iowa State victory coming in 2007 in Ames. The Wildcats were led by a two-touchdown performance by junior wide receiver Isaiah Zuber, as the offense garnered 428 yards of total offense, 245 of which came on the ground. K-State benefited from Iowa State’s mishaps, scoring 21 points off 3 turnovers, including the first two career interceptions for junior defensive back Kevion McGee. Iowa State (7-4, 6-3 Big 12) totaled 493 yards, including 337 yards through the air, while junior running back David Montgomery rushed for a season-high 3 touchdowns. The Cyclones put the first points on the board with 5:15 left in the first quarter, when Iowa State marched the football 60-yards on six plays, capping the drive off with a 1-yard touchdown pass from freshman quarterback Brock Purdy to redshirt junior wide receiver Hakeem Butler to take a 7-0 lead. The Wildcats evened up the score at the start of the second quarter, as K-State used an 11-play, 71-yard drive to find the end zone. Junior running back Alex Barnes took the handoff from 10 yards out, before barreling into the end zone to tie the score at 7-7 with 14:26 left in the second quarter. The Cyclones were quick to respond with a score of their own, as Purdy found Butler open for a 65-yard completion, that brought the Iowa State possession to the K-State 3-yard line. On the next play, junior running back David Montgomery pushed into the end zone for a 3-yard score, as Iowa State led 14-7 at the 12:15 mark of the second quarter. After the Iowa State touchdown, the Wildcats looked to bounce back starting at their own 15-yard line. On third down, sophomore quarterback Skylar Thompson found junior wide receiver Isaiah Zuber open for a 31-yard completion down to the Iowa State 25-yard line. From there, the Wildcats were able to punch the ball in on the ground, as Thompson scored on a 4-yard touchdown rush to make the score knotted at 14-14 with 6:50 left in the first half. With the score knotted late in the half, the K-State defense came in clutch with their backs against the wall. With Iowa State threatening, the K-State defense held strong and forced the Cyclones to attempt a 38-yard field goal, which was unsuccessful. With under a minute left in the half, senior defensive back Colby Moore punched the ball lose on a K-State punt, leading to a Wildcat recovery at the Iowa State 34-yard line. The Wildcats made good use of the field position, as Thompson found Zuber in the end zone for a 6-yard touchdown with just 30 seconds left in the half. K-State took the 21-14 lead into the locker room. Iowa State received the kick in the second half and took the ball 70 yards on 5 plays, that was capped off by Montgomery’s second touchdown of the game, this time from 11-yards out to make the score 21-21 at 12:23 in the third quarter. K-State grabbed the lead again behind a Blake Lynch field goal in the third quarter from 36-yards out, bringing the score to 24-21. On the next defensive possession, the K-State defense came up with another big stop, as junior defensive back Kevion McGee intercepted Purdy at the K-State 8-yard line. After the Iowa State turnover, the Wildcats looked to capitalize on the Cyclone mistake, in which K-State used an 8-play, 92-yard drive to expand its lead to 10. The drive was capitalized by a 9-yard touchdown pass from Thompson to redshirt freshman wide receiver Chabastin Taylor, his first-career touchdown, to make the score 31-21 with 4:25 left in the third quarter. With a 10-point lead, the Wildcats converted on another Iowa State turnover, as McGee intercepted Purdy for the second time of the day. The interception set up the Wildcats with possession at the K-State 48-yard line. K-State was able to convert on the second-straight interception by McGee, as the Wildcats moved the ball into the red zone, before scoring on a 4-yard touchdown pass from Thompson to Zuber, marking Thompson’s third touchdown pass of the game and second to Zuber, as K-State led 38-21 with 12:22 left in the game. Iowa State responded with a scoring run of its own, scoring 14 points unanswered, including a 21-yard fumble recovery for a touchdown by freshman linebacker Mike Rose. Iowa State closed in on the K-State lead, 38-35 with 8:25 left. With 4:29 left in the game, Iowa State took over the lead at 42-38 for the first time since the first half. Montgomery found his third touchdown rush of the game on an 18-yard scamper. On the final K-State possession of the game, the Wildcats needed a touchdown to take over the lead, however, they came up empty on fourth down, allowing Iowa State to run out the clock. Isaiah Zuber – Junior wide receiver Isaiah Zuber hauled in 7 receptions for 65 yards and two touchdowns on Saturday, tying a career-high in touchdowns set earlier this season against UTSA. Zuber was Thompson’s top target on Saturday, leading the team in receiving. Alex Barnes – Topping the 100-yard plateau for the seventh time this season, junior running back Alex Barnes took 28 carries for 184 yards and a touchdown against the Cyclones. Kevion McGee – The junior defensive back came up with two interceptions in the third quarter, marking his first two career interceptions as a Wildcat. 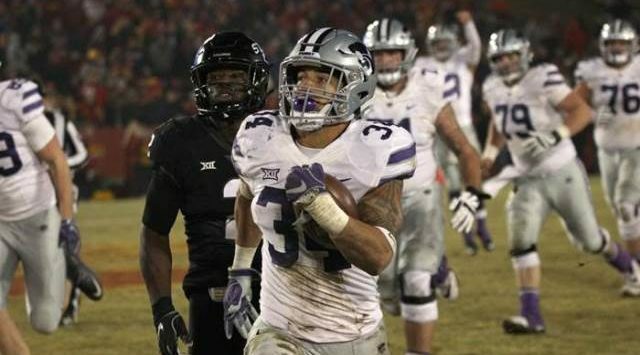 McGee’s interceptions came at a good time for the Wildcats, as K-State scored 14 points off the two turnovers. Colby Moore – Late in the second half, senior defensive back Colby Moore forced an influential special teams’ turnover, punching the football out on a K-State punt. The Wildcats would go on to score off the turnover, giving the Wildcats a 21-14 lead going into halftime. 80 – The 80 points scored on Saturday between the Wildcats and Cyclones are the most in series history, as the teams have faced off 102 times since the inaugural meeting in 1917.